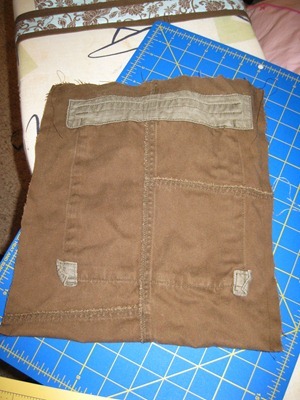 A long time ago I mentally bookmarked this tutorial from noodlehead to make a messenger bag from a pair of cargo pants. 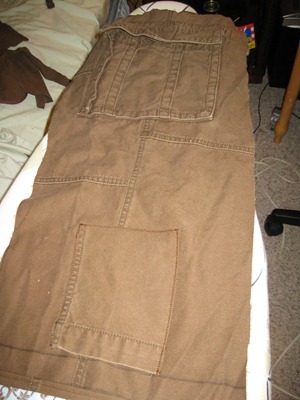 I even went to a thrift shop and bought a pair… and they sat, and sat, and sat down in the “to recycle” pile. Note to self: mental bookmarks are not the way to go when your brain is like swiss cheese! Anyway, I finally got around to it when I decided my old purse wasn’t working out. I love it, but it’s so open on top that things fall out of it. After losing my phone in the car a few times I decided to get serious about making a new purse. So I went back to that tutorial, and realized it was too much like the scavenger hunt bag I made for BB in its construction (ie. too much work). 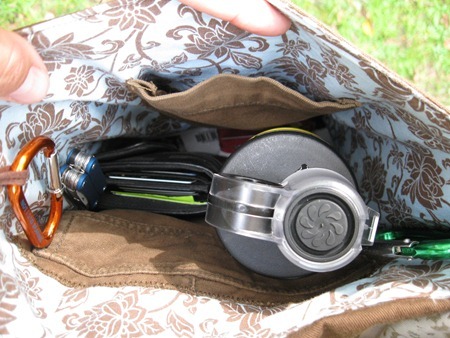 In light of that, I came up with a similar bag with a simpler construction. 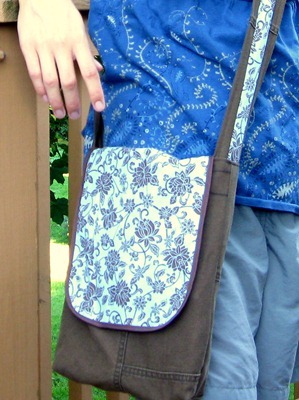 (At least it was supposed to be simpler, until I decided to add pockets on every available surface, because really, what good is a purse that is not full of pockets?) Here it is! 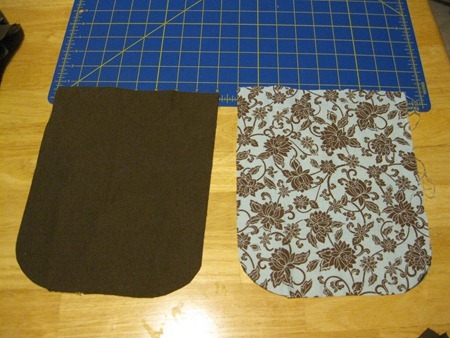 I cut out one big piece of the outer fabric and one of the lining. 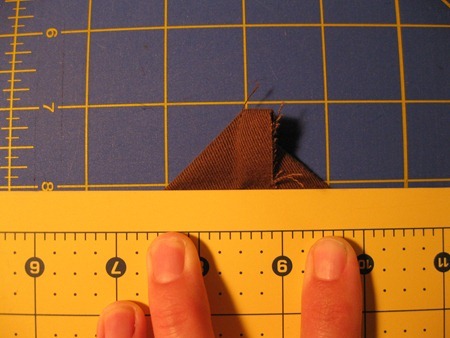 They measured 25” x 11”, but it could be made any size. In retrospect I think it should be shallower (less than 25” long would be better, I think). 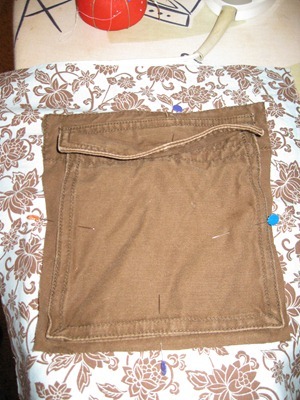 The pocket from the cargo pants will end up on the outside of the bag. 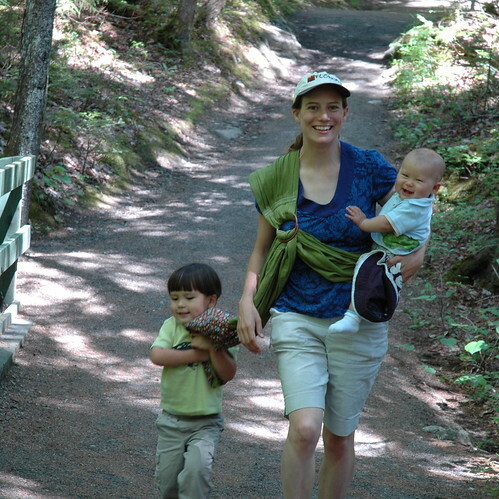 I wanted a 2” wide strap, and the length I just eyeballed based on draping it over my shoulder – very scientific! The easy way would be to cut pieces 3” wide of outer and lining, but I was running out of lining fabric so I cut a 2” wide piece of the lining fabric and a 4” wide piece of the outer fabric. 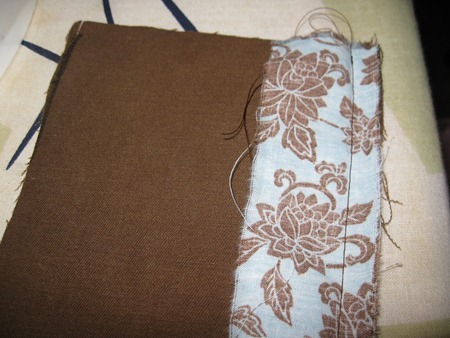 Also pictured: sort-of-matching bias tape used to trim the flap. 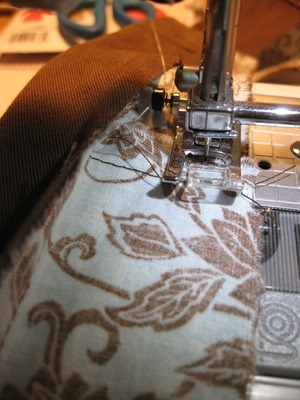 Constructing the strap: place inner and outer pieces right sides together and sew. 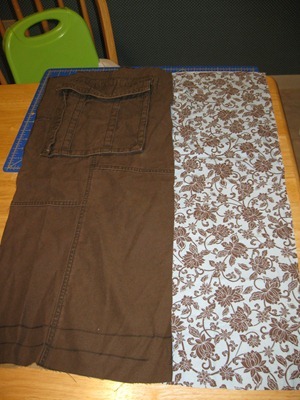 Then match up the other side to make a tube, wrong sides together, and sew. 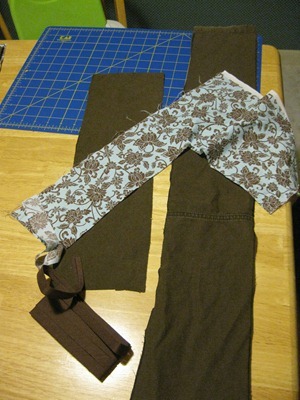 Turn the tube right side out, center the contrast fabric, and press. Topstitch along the edges. Square the corners: There may be better instructions out there but I’ll try: flatten the bottom corners as shown: I wanted to make a 2” wide corner, so I made a line where it was 2”, then sewed along it. Snip off corner. Done! 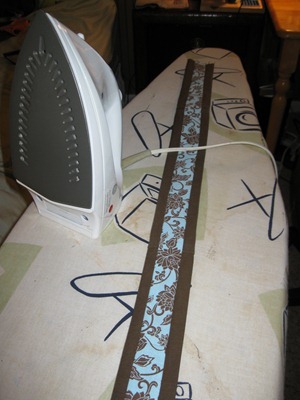 Repeat on the other corner, and for both corners on the lining. Final assembly: With the outer part of the bag right side out, pin the straps in place, right sides together. 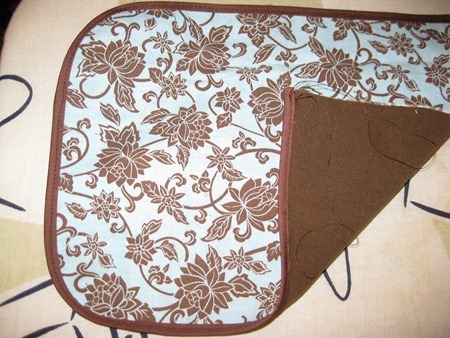 Then pin the flap in place right sides together. 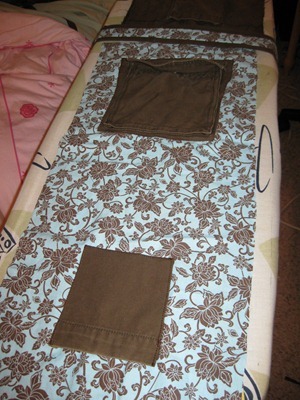 Finally, turn the lining inside out and shove everything into it, matching up side seams. Pin all around. 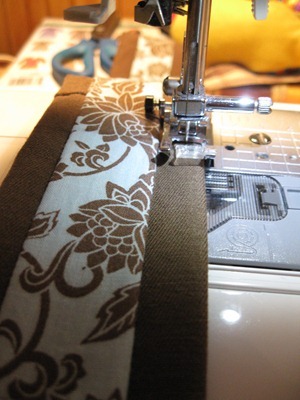 Sew, leaving an opening to turn. It’s pretty bulky, 3” should do it. Turn right side out and if you did everything right in the previous step you have a purse! 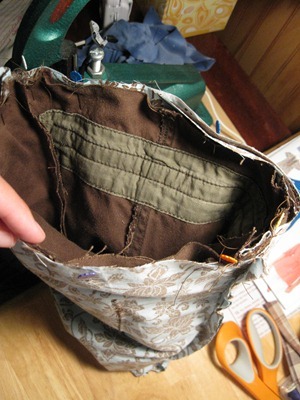 Topstitch that opening closed and you are done. Take a picture before you even wash off the marker! 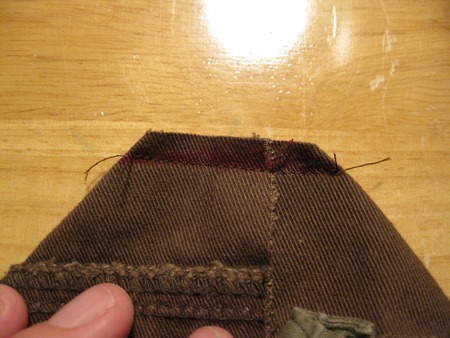 I didn’t do a closure, I think the flap stays closed fine without any help. 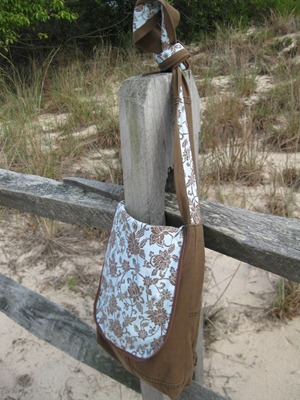 I am in love with this pocket-laden, messenger-style, machine washable bag. Only a mom could be so geeked out about this, but that outer cargo pocket (on the back) holds a diaper and wipes, so this is my diaper bag too! Hope this inspires someone to make their own! I am entering this in A Lemon Squeezy Home’s Purse week, check it out for some way better tutorials and substantially more fashionable entries! * You can control exactly what’s in your yogurt. No HFCS, colors, gelatin, nothing you don’t want! 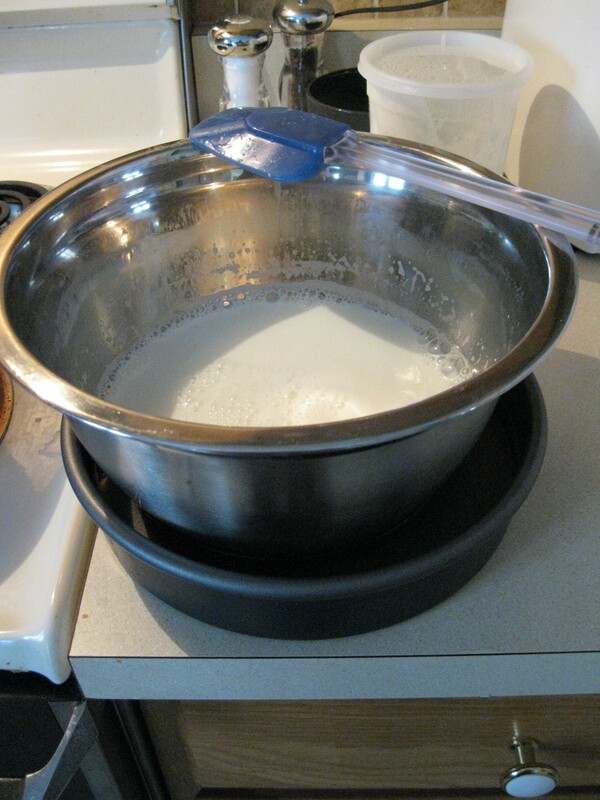 * If you are making organic yogurt, it’s MUCH cheaper to make your own. Organic yogurt can go for $1/6oz cup. I can buy a half gallon of organic milk for $3 and make it into yogurt, 64 oz. worth, which is a savings of about $7 per batch. We eat a lot of yogurt, so this is a big savings for us. * It’s tasty! And fun! You get to culture bacteria! *thermos, or other device that holds a steady temperature. And on to the photo tutorial, so you can see how simple it is! 2) Optional: add some powdered milk. This results in a thicker yogurt. I like thicker yogurt, so I do this, but I suppose I am diluting the wholesome organic-ness of it all. I’m OK with that. It does add calcium and protein, too. I don’t measure, I just sprinkle, about 1/2 cup. 3) Stir this occasionally and check the temperature. It needs to come up to 185 F. It is my understanding that this is to kill any unwanted bacteria (ie. you are re-pastuerizing the milk). No! Further research indicates that it is to alter the proteins in the milk so that the yogurt will thicken. And, that the longer you hold it at this temperature, the thicker it will be. Now, I am no microbiologist, but I have to imagine that this also kills unwanted bacteria, because even pasteurized milk can go bad, hence it must have bacteria. I will have to keep looking into this. 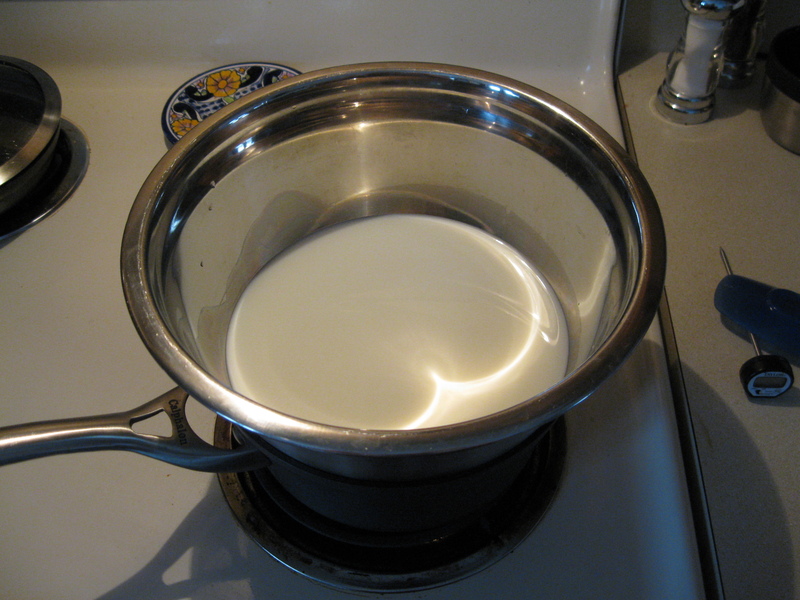 4) Now the milk needs to cool to about 120-115 F. So, take the bowl off the stove, and put it in a pan of cool water. This will speed up the cooling process. Stir occasionally to prevent a skin forming on top, and check your temperature. It’s not a bad idea to warm up your starter to room temperature (you can see mine behind the bowl). 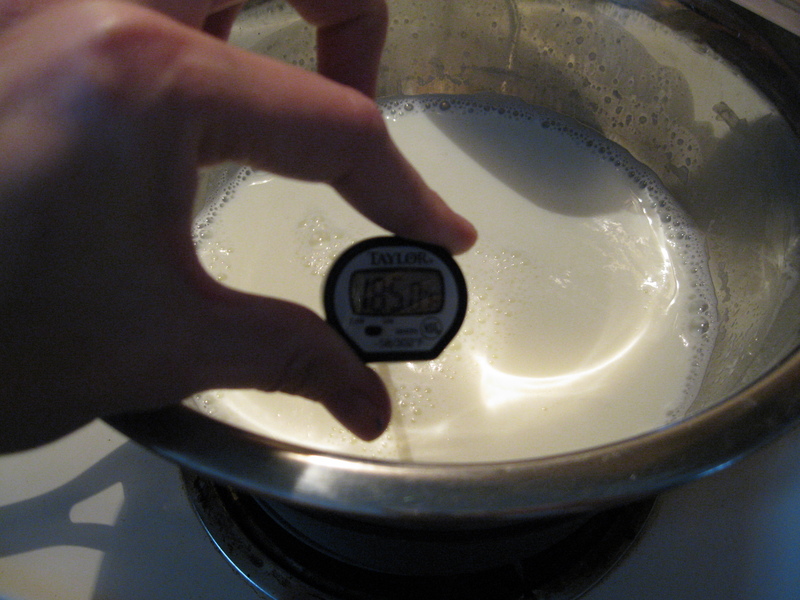 5) Now, to make yogurt, you have to hold the milk at about 110F for a long time. There are lots of ways to do this, but what I have found to be the best is a thermos. So at this point, I pre-heat my thermos by boiling a cup of water and pouring it in the thermos. 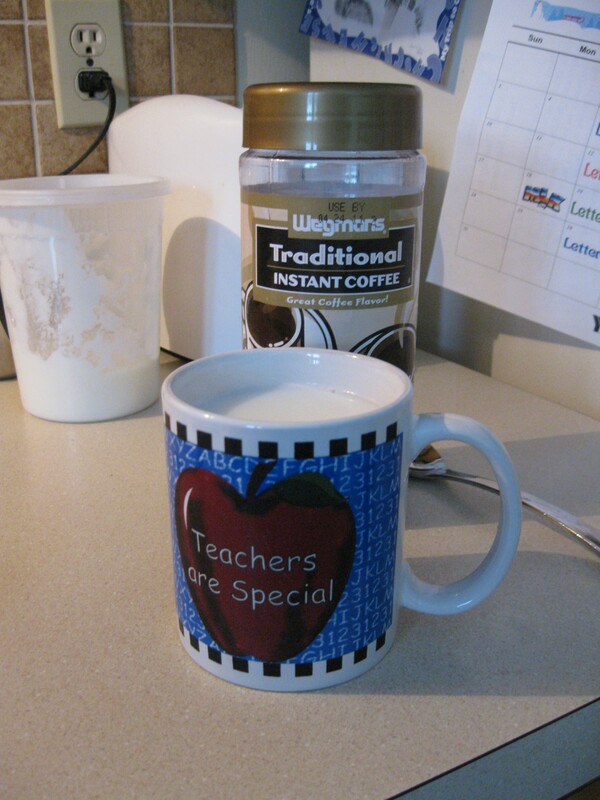 That way, I don’t drop the temperature of the milk by pouring it into a cold thermos. While you’re at it, make yourself some coffee, because, let’s face it, you’re not getting a nap today. 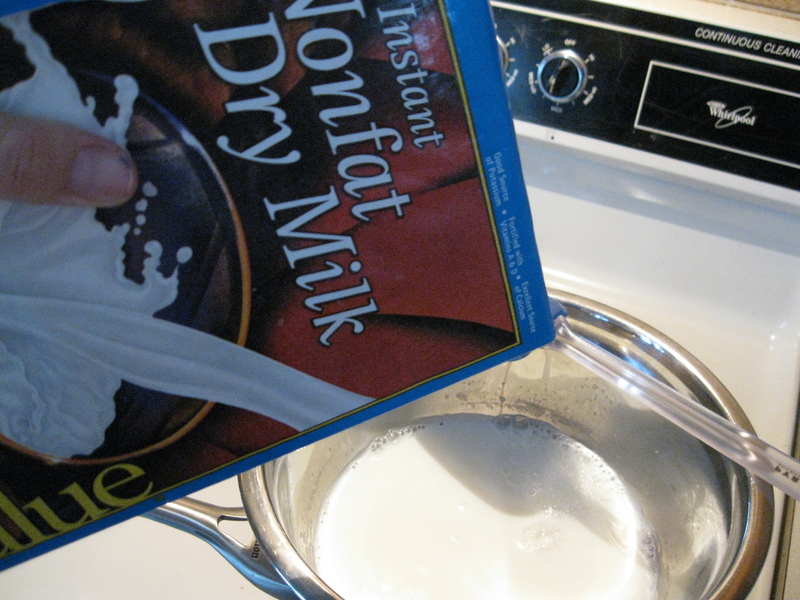 6) Once the milk is at about 120, dump the hot water out of the thermos, and pour in about half of your milk. 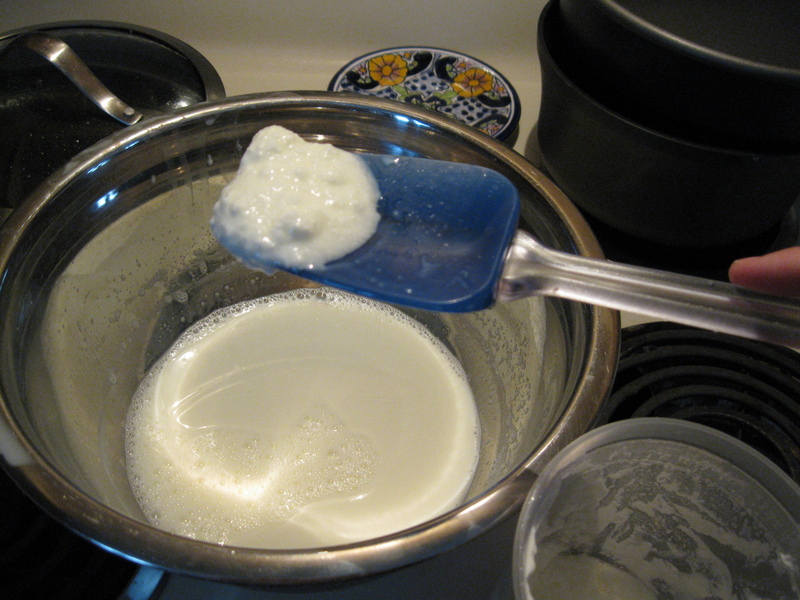 Then, add your starter culture to the milk that remains in the bowl. I use 2-3 Tbsp. Again, measuring is for sissies. Stir them in well to disperse. 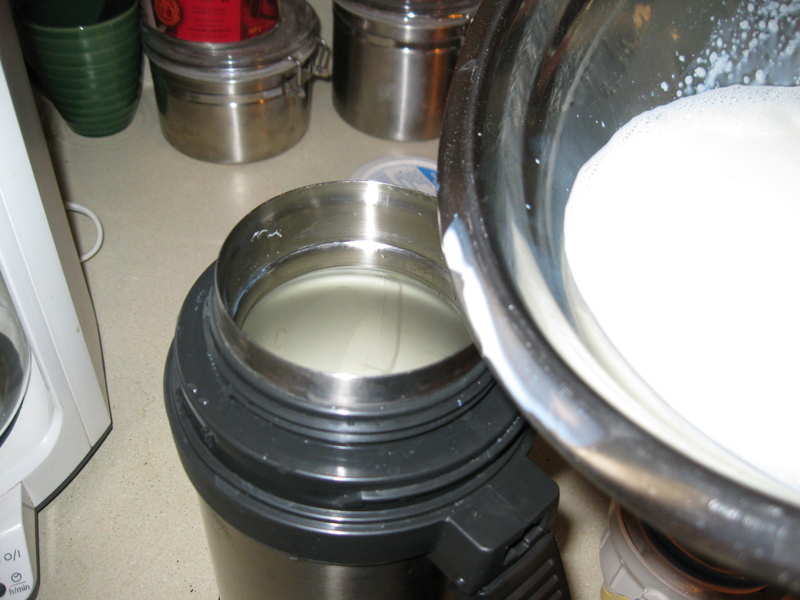 7) Pour this inoculated milk into the thermos too. 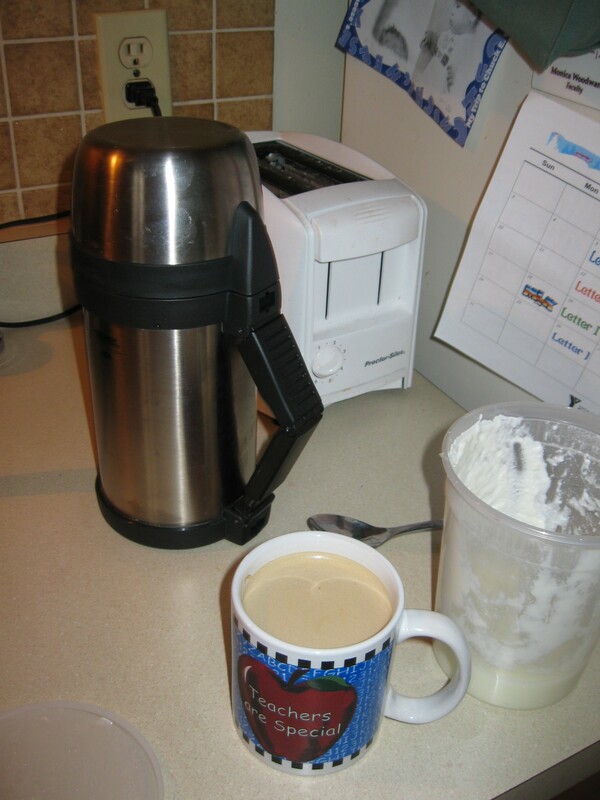 8) Put the lid on, and enjoy your coffee and a little snack of yogurt! I finish off my last batch when making the next. Then wait for 6-8 hours, and your batch of yogurt will be ready! * The longer you let the milk culture, the more tart and firm it will be. Also, the less lactose will be in the finished yogurt, since it is consumed by the bacteria. Theoretically, yogurt is OK for lactose intolerant people if it is cultured for long enough that the bacteria digest all the lactose. With store-bought yogurt, you don’t know if that is the case or not, so there’s another case for DIYing it. * You can use the yogurt you made this time to start the next batch, just make sure to save a little! Or, you can freeze a little bit of it to use next time, if it’s going to be a while before you do this again. I think next time I might buy a DanActive and culture that to see if their “immunity boosting” bacteria are really all that. * Why doesn’t ultra pasteurized milk work? Apparently the process significantly alters the proteins in the milk. Kind of sketchy, if you ask me. But it’s what we buy mostly, because we don’t go through milk fast enough to drink it before it goes bad. Well, that’s another advantage to yogurt, I guess: the good bacteria keep the bad ones at bay, so yogurt stays good for a really long time. * How long does it take? Not that long, but longer than you think. There’s a lot of waiting for things to heat, and then cool. I like to have something else to work on while I stir intermittently. This time I was cutting fabric. 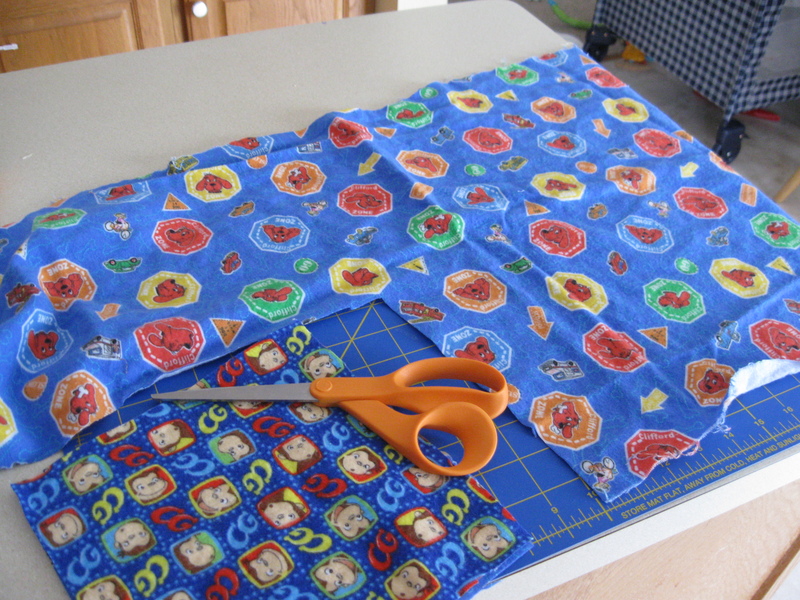 I’m making a quilt for big brother (he picked the fabric), and I’m cutting lots of squares. I can’t find my rotary cutter, so I’m using scissors, one square at a time. It is truly a labor of love. Anyway, let’s just say it took a lot longer to write this than it did to make the yogurt.